Eggs are one of nature's most nutritious foods, and one of the major sources of food-borne illness. 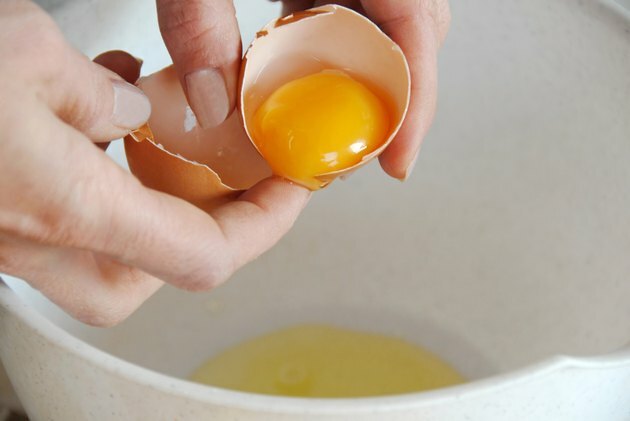 Salmonella bacteria can live on the inside and the outside of raw eggs, which is why the CDC recommends cooking all raw eggs until both the yolk and the white are firm. However, if you're making a dish that calls for raw eggs, like Caesar salad dressing or homemade mayonnaise, you don't have to give up the richness that eggs can bring. Instead, you can use pasteurized egg products or pasteurized shell eggs. With a little information, and proper food safety techniques, these are safe to eat raw. The Epicurious Food Dictionary defines pasteurization as the process of heating a food to either 145 degrees for 30 minutes or to 161 degrees F for 15 seconds, then rapidly cooling the liquid for refrigeration. The process kills dangerous microbial life and enhances the safety of foods. Discovered by French scientist Louis Pasteur, and first used to purify milk, manufacturers now pasteurize a wide variety of food products, including eggs. There are several market varieties of pasteurized eggs available in American supermarkets. The most common is boxed eggs. These, according to the USDA, are eggs that have been removed from their shells prior to packaging. These products come in a variety of forms, from packaged egg yolks to whole eggs to packaged whites. A less-commonly available type of egg is pasteurized whole shell eggs, which, according to chef Alton Brown are a good choice for all egg-based dishes intended for high-risk populations such as the elderly, children under 10 years of age, expectant mothers, and anyone with immune system problems. Handled properly, pasteurized eggs, whether they are packaged or whole in the shell, are safe to eat raw. The USDA recommends using these eggs for uncooked dishes such as homemade mayonnaise, Hollandaise sauce, or Caesar salad dressing. Since these dishes rely on beaten eggs, packaged eggs are a convenient choice, since you don't have to separate the eggs and they beat more easily than raw eggs. Another advantage of packaged egg products is that they are available virtually everywhere, whereas pasteurized shell eggs are not found in all areas. Though pasteurized eggs are far less dangerous than raw unpasteurized eggs, they can make you sick if you handle them improperly. As with all fresh, high-protein foods, pasteurized eggs will go bad if stored at room temperature. Keep eggs in the refrigerator and remove them right before cooking. You should consume your egg-based dishes promptly, refrigerate any leftovers within an hour of cooking, and toss any egg-based dishes after four days in the fridge. Also, do not eat pasteurized eggs past the use-by date or consume them if they look or smell "off."